Choreographed for maximum appeal, pop culture likes to say yes. History is made by those who say no. Can words be pop? A few decades ago, “Anthropocene” did not really exist, but its Google Ngram looks like a swift takeoff, similar in shape to the graphs for atmospheric CO2 concentration or species extinction. It is at least bubbling under. “Anthropocene” doesn’t refer precisely to climate change or global warming. Rather, it indicates the idea that we are living in an era akin to other geological epochs, like the Pleistocene, but characterized by the fact that human activities now make and remake the planetary ecosystem in the most concrete sense: the composition of the earth’s crust, the makeup of its atmosphere, the direct and indirect relations among the whole rig’s parts. Formulated by ecologist Eugene Stoermer and popularized around 2000 by Paul Crutzen, a Nobel Prize–winning atmospheric chemist, “Anthropocene” is intended to signal a radical break and an absolute catastrophe. In previous epochs, the flora and fauna of the planet were part of a rolling equilibrium. Now anthropos has leapt from its limited role to give the entire ecosystem one direction. This is “the Great Acceleration.” The changes set in motion are at the point of becoming self-reproducing, of proceeding on their own no matter what we do. The direction is toward complete destruction of the planetary equilibrium. We’re taking it all down with us. The fear haunting such knowledge has made its way into the traditional channels of culture, film especially. Half of the year’s blockbusters fit into Cinema of the Anthropocene. An annihilating power, beyond human scale but still somehow set loose by humans, cannot be recalled; the disaster will be civilizational, planetary—Godzilla, Noah, Edge of Tomorrow. What part of Transformers: Age of Extinction do you not understand? There is certainly something suggestive about the whirling, recombinatory machines in Transformers, at which the puny humans gaze in apprehensive wonder. Are they the “Anthropocene”? Not really. The word itself is not an analysis. An analysis tells you where to intervene; “Anthropocene” fails this measure utterly. Anthropoi, humans, have a history stretching back at least 50,000 years. The standard accounts of the anthropogenic transformation of the planet date it only to the late eighteenth century, to the invention of the steam engine and the Industrial Revolution, the cauldron from whence the transformational machines arise. But there is a fatal risk in associating “Anthropocene” with specific technologies, as if one could abolish them to make things right. Or as if good technology might overcome the bad to rescue humanity—the dream of the Autobots, surely stand-ins these days for green capitalism. But all of this is to misrecognize the history of machines. The idea that humans make machines out of some need to conquer nature, or out of some ineradicable appetite for power and destruction, can’t explain why this deep human nature would be born so suddenly and so late. In point of fact, the trajectory of ecocidal technologies is indissociable from the competition for ever-greater productivity, the need to make ever more things to be sold more swiftly, to exploit labor more effectively. Machines are an effect of capitalism’s compulsion. If we broke them, like the Luddites of 1811, they would be built again. Not because of someone’s greed or shortsightedness, but because capitalists have no choice but to outcompete each other or cease to exist. “Anthropocene,” we might say, is a social relation. It is the penultimate stage of capitalism. You don’t want to see the ultimate. Not surprisingly, there is an open struggle to make this understanding itself popular knowledge before it’s too late. Naomi Klein’s This Changes Everything: Capitalism vs. the Climate will be the most discussed nonfiction book since Thomas Piketty’s pop smash. 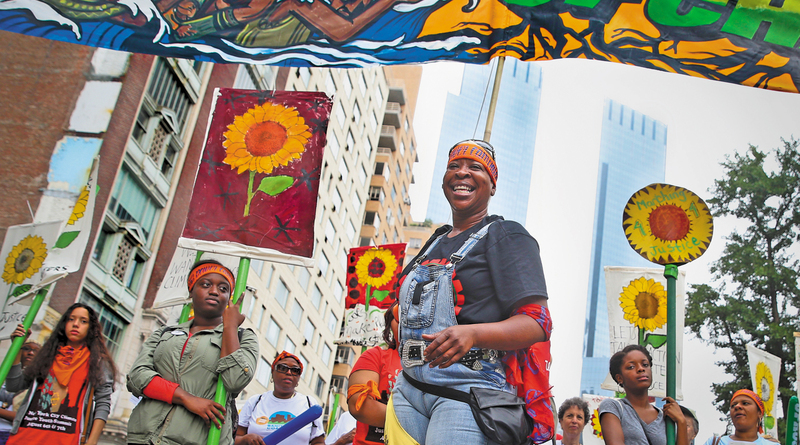 The People’s Climate March delivered 400,000 people to the streets of Manhattan, in addition to lesser events here and there around the nation and the globe. Ain’t that pop? There is some sense that the struggle for “mindshare”—the lingo of publicists gets at the oddity of pop’s conjuncture with life-and-death politics—is trending in the right direction. At the same time, it is hard not to glance back despairingly at February 2003, when 1.5 million protesters in Madrid, twice that in Rome, perhaps 10 million people globally, managed to divert the impending invasion of Iraq by not a single degree. The pop march seems to have lost much of its traction. The history of the “Anthropocene,” the massive takeoff of populations, cities and commodity production on a mass scale, is also the history of pop culture itself. It is finally difficult to believe that pop forms can offer adequate opposition to this history. Like conventional pop culture, the People’s Climate March will not easily outpace its corporate context as an event promoted by Climate Week NYC, brought to you by, e.g., the Rockefellers and Lockheed Martin (corporations are people too). Like pop, it was choreographed for maximum appeal without frightening the horses, in cooperation with the city and police. It lacked any “divisive” claims, much less strategies. Popular front, popular culture, yes. This is not to diminish the exuberant commitment of the participants. At the same time, we must reckon with the fact that pop culture really likes to be agreeable along with its thrills. It likes to say yes, and makes endless conciliations to do so. It is safer to say yes. Yes can be deeply pleasurable. History is made by those who say no.